Students explore the wide range of acid and bases and their effect on indicator dyes with this kit. In this popular Applied Science Concept Kit, students perform a series of colorful tests that help them develop a better understanding of pH and its relationship to acids and bases. Using LAB-AIDS Chemplates® and a universal indicator, students creates their own individual pH color guide. 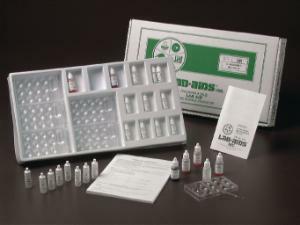 They use this color guide to identify the pH of the three unknowns, which are provided in this kit. Ordering information: This kit includes Chemplates, LAB-AIDS, bromothymol blue, methyl orange, phenolphthalein, a universal indicator, pH 1; 3; 5; 7; 9; 11; and 13, and unknowns #1; #2; and #3.